One of the most disturbing instances is when ants get into your dog’s kibble. I am sure that this is a problem you have at one or several times had to deal with. Getting rid of the ants is a challenging task, and this is why you need to know how to keep ants out of dog food. This will make that your dog keeps taking his kibble peacefully without worrying about the ants. Keeping ants from invading your dog food may appear as a very simple task. To some people, it may be an uphill task and that is why this article has been written. This article is going to dwell on some basic tips that every dog owner needs to know to help in keeping the ants away from the dog food. RELATED: How Many Cups of Dog Food Are in A Pound of Dog Food? The methods discussed below have been used before and proved to be very effective. They are just a tip of the iceberg when it comes to the methods ideal for controlling ants from invading dog food. There are other methods that we have not discussed but can still be very effective. Petroleum jelly creates a barrier when ants want to get into your dog’s kibble. It is recommended that petroleum jelly should be used in conjunction with an elevated dog bowl. If you apply petroleum jelly on the material used to raise the bowl, the ants will never get to your dog food. This is because ants can barely walk past petroleum jelly because they will get stuck. This makes them avoid getting into contact with the food. Petroleum jelly has no health effects to your canine friend. This makes it safe to be used when keeping ants away from your dog’s food. You should apply some petroleum jelly to the top rim to prevent them from getting to your dog’s food. You can also apply it at the bottom rim of your dog’s feeding bowl to prevent the insects from getting any closer to the top of the bowl. The presence of water around your dog’s food bowl will prevent ants from getting to your dog’s kibble. The water is likely to drown the ants. 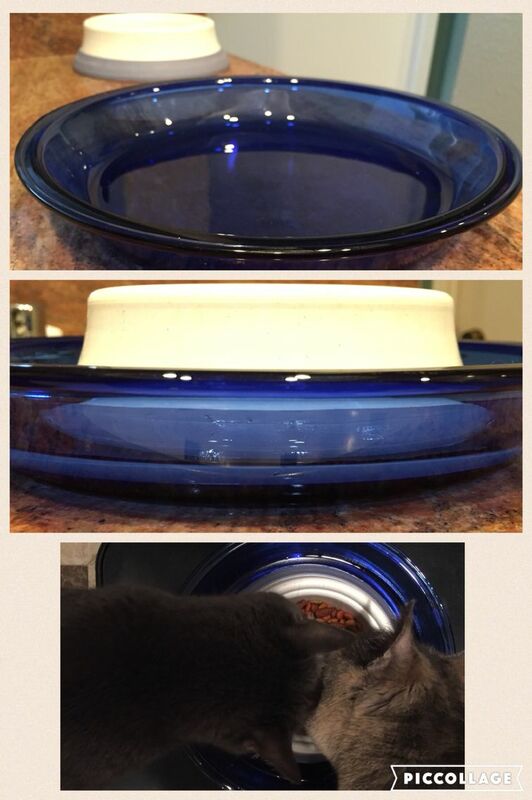 You can use a baking dish, place the food bowl inside and add just enough water to create a modified moat. Place the dish with a moat in various locations for several days. This will make the ants to stop going back to the place they were used to as their feeding place. To keep the ants away from your home, use peppermint oil. Mix a tablespoon of peppermint oil with a cup of water. Spray it around your kitchen, and you will no longer have to withstand insects running all over your house. If the insects cannot get to your house, by no chance will they get anywhere near your dog’s food bowl. You can also choose to rub some peppermint oil on your dog’s food bowl or near the bowl. Be sure to use just a little of it because it has a strong smell which your dog may dislike. It might cause some irritation. There is a better way to prevent the ants from getting to your dog’s food. You can keep them from following the scent of your dog’s food by disrupting their trail. This can be done by sprinkling some baby powder at the point where the ants get into your home. By sprinkling a little talc around your pet’s food dish, you will cause a hasty retreat of all the ants that could be targeting your dog’s kibble. Another way to disrupt the trail of ants which could be heading to your dog’s kibble is by placing a mat under the dog’s food bowl. Wash off the kibble crumbs from the mat using water and soap. Ensure that you wash the food bowl after your dog finishes its kibble and wipe the floor where the dog’s bowl is placed. Use a gentle cleanser and wipe the trail where you have seen the ants passing, to where your feed has its meals. This is a powder which is crystal-like in appearance and very fine. It is extracted from sedimentary rocks. You can use it to prevent ants from getting to your dog’s kibble. It works very fast by cutting the bodies of the ants which make them dehydrated.It works very fast, such that the ants will die before they can reach your canine friend’s kibble. If you have some of diatomaceous earth to surround your dog’s food bowl, no insect can get near it. In the market, there are pet food dishes that are ant-proof. There are those which are meant to be placed indoors, and others are perfect for outdoor purposes. There are varieties of which you will be at liberty to choose from to ensure that they fulfill your dog’s needs. There are a variety of containers in which you can put your dog’s kibble in a sealed container to prevent ants from getting into your dog’s kibble. For instance, the Tupperware and coffee cans. A resealable zipper storage bag is a better option. When placed inside a container which is airtight, it will offer a great barrier against ants which are likely to get into your dog’s kibble. At times, you might forget to take the necessary precautions to keep ants from your dog’s food. If this is the case, place the kibble in a freezer. Let the dog food stay there long enough till it's frozen. By this time the ants will be dead. At this point, it will be easy to sift out the dead ants from the kibble. You can choose to work on the kibble in batches or better, use a strainer with which you will sift out the dead ants over a trash can or a sink. Ants’ invasion into your dog’s kibble is terrible. Your canine friend may refuse to consume its food which can make you get some more kibble which will translate to an unplanned for expenditure. This will certainly cause a strain on your budget. Use these tips to learn how to keep ants out of dog food. By doing so, your dog will enjoy its kibble with no disruption from the annoying tiny ants.